We’ve all had our fair share of interviews and it’s usually a standard experience; you meet with someone from the HR, they assess your qualifications and personality and you exit the interview feeling confident. Sounds like a simple straight forward method. Why am I not getting a callback though? 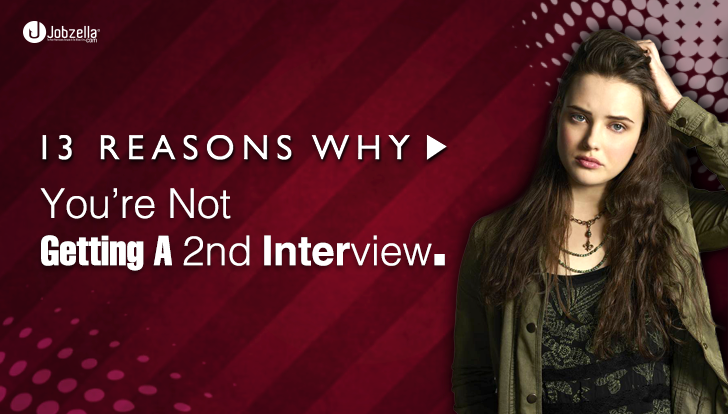 Why is no one calling for a 2nd interview? Jobzella gives you 13 reasons why you’re getting rejected. Let’s face it, some people are blessed with socials skills while others aren’t. Although you might be qualified for the job you’re applying for, your social skills aren’t honed enough to convince the interviewer; leading to rejection for the job post. It’s true, there is such a thing as being too qualified. If you’re qualified enough to work as a senior and you’re applying for a junior position, the manager might have concerns about not being able to rise up to your pay expectations. Overqualified employees are also more likely to quit the job in favor of another high paying position. Age is not just a number; these days, it’s a young man’s world. The trend of startups and the hard working millennial generation has rendered the older generations obsolete. Young people are more tech-savvy, get paid less and have more ambitions for growth. The hiring process is costly; it takes a lot of man hours to complete the filtering and selection process. A candidate with a lot jobs on his/her CV with short intervals signals a jumper. Someone who switches jobs every 4-5 months is not worth the hassle of hiring. Being well prepared is a basic requirement for acing any interview. Preparing for an interview includes researching the company you’re applying to work for as well as reading up on the job description and its requirements. The interview went well, you’re obviously qualified for the job. However, your personality might not fit with the company’s environment. You’re too formal for a casual work environment, the chemistry didn’t click with you and the hiring manager. It happens; so get back on the horse and venture for a new opportunity. The interviewer might sometimes feel that you’re not enthused enough to carry out the tasks required. They may sense that you’re looking for any job regardless of your aspirations. This reflects back to the hiring manager and may indicate poor performance levels. Hiring managers need to get a sense of your performance. The only way to do that is to contact previous employers. The references you use should be strong enough to support you. Always ask your references for permission and make sure they have positive things to say about you. Every vacancy has numerous applicants applying for it. In a sense, it’s akin to a competition where you must prove your worth. It’s very possible that you are highly qualified for the position but you could not compete well enough with other candidates. Selling yourself; it’s a skill that some possess and others don’t. In an interview, you must convey your qualifications and expertise in the shortest and most efficient way possible. A candidate could fit perfectly for a position. However, due to the inability to sell his/her qualifications, the hiring manager decides to go in another direction. An employee who’s willing to say bad thing about his employer would likely do it again if hired. Such negative attitude is never welcome in a company. Sometimes it’s actually true. Organizational changes happen all the time; your position might have been put on hold until further notice. This time it wasn’t you fault. The reason for being rejected could be as simple as not being qualified enough to carry the tasks required from you.